Easy spice-rubbed grilled BBQ chicken rice bowl. This BBQ chicken can stand on its own OR serve it with cilantro-lime rice, black beans, corn, cheddar cheese, avocado, tortilla strips, and an addictive spicy-sweet BBQ sauce. This is a meal you’ll want to make over and over again! Make this grilled BBQ chicken as a standalone chicken dish or in a BBQ chicken rice bowl. This recipe is great for weekly meal prep or a makes for a delicious dinner served alongside roasted brussel sprouts or roasted carrots. Rice: start the rice going first. We’re making a simple cilantro lime rice for these bowls! Prep the chicken: toss together the seasonings, drizzle some oil on the chicken, and then pat the mix on all sides of the chicken. Make sure to slice the chicken breasts in half or pound them into even pieces before adding the seasoning blend. This ensures even cooking and that every part of the chicken is deliciously seasoned! Cook: use an outdoor grill, indoor grill pan, or skillet to cook the chicken. More directions for alternate cooking methods/tips below. Sauce: whisk together the tastiest 2 “ingredient” sauce and drizzle all over. 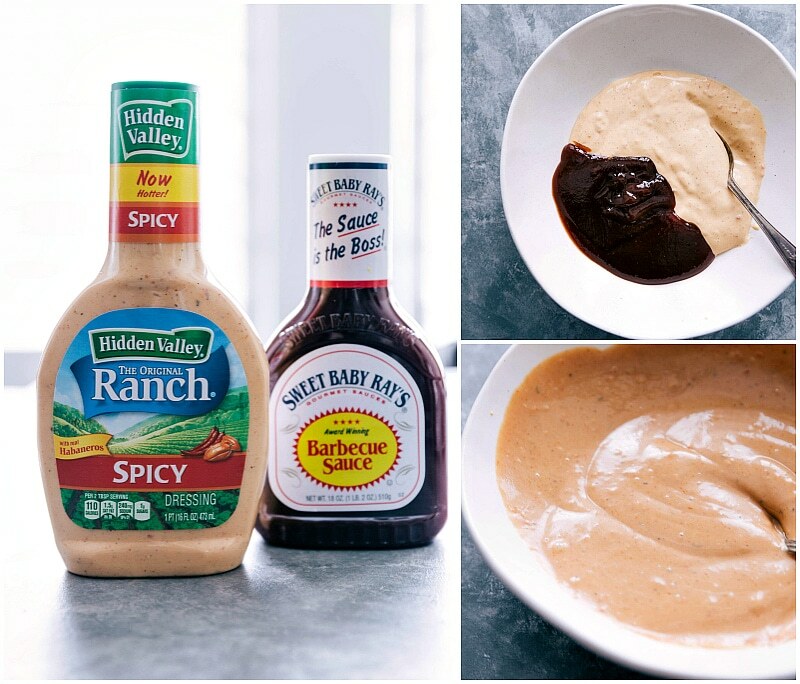 Alternatively you can just add plain BBQ sauce to your grilled BBQ chicken! Sauce note: I’m not often a proponent of store bought dressings because I think homemade dressings are relatively quick to make, they’re more economical, and they’re far tastier. HOWEVER, today, we’re going for few ingredients + fast prep so we’re grabbing a store-bought dressing (Jalapeño Ranch; pictured below) and store-bought sauce (BBQ sauce). And it just works. This two ingredient sauce is the perfect complement to the veggies and beans, has the perfect amount of kick & sweetness – and best of all – it’s FAST. Toppings/Assembly: rice first, chicken next, then your choice of toppings (such as cheddar cheese, black beans, roasted corn, avocado or guac, and tortilla strips), and finally that easy 2 ingredient sauce. How easy is that chicken rice bowl to make? Generously oil your grill grates. I do this by rolling up a few paper towels, drenching them in oil (canola or vegetable), and using tongs, rub the drenched paper towels along the grill grates. Doing this will contribute to a beautiful sear, and ensure the chicken doesn’t stick to the grates. Fully preheat your grill. I know it’s hard to wait, but adding meat to a fully preheated grill will sear the surface of the meat which will give you a juicier chicken. It also allows the chicken to get a great char. Let the cooked chicken rest, tented with foil, for 5-10 minutes before cutting in. This allows a redistribution of the juices inside the chicken. Not grilling the chicken? Check below for alternative cooking methods. Baked Chicken: Preheat oven to 450 degrees F. Place chicken on a baking sheet (do not cut breasts in half for this method) lined with parchment paper. Bake for approximately 15-18 minutes, flipping the chicken halfway. Remove from the oven, and loosely cover sheet pan with foil. Let the chicken rest for 5-10 minutes. Sauteed Chicken: Heat 1 tablespoon oil in a sauté pan over medium-high heat. Add (horizontally halved) chicken breast and cook for 4-6 minutes per side until the chicken is cooked through and the juices run clear. As you saute the chicken, brush it generously with the reserved marinade. Transfer the chicken to a clean plate, and loosely cover with foil. Let the chicken rest for 5-10 minutes. 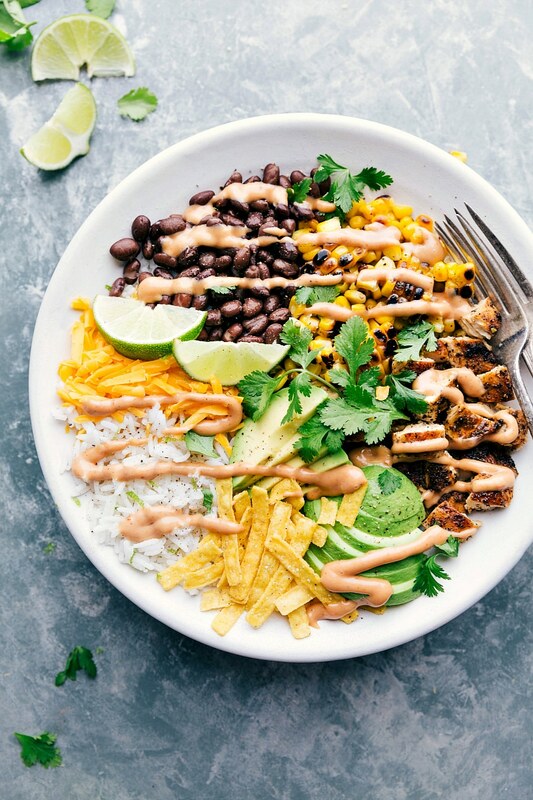 While you can of course serve the grilled BBQ chicken on it’s own, our favorite way is to serve it in a burrito bowl type meal! 🙂 Below are some variation ideas if you’re looking to change up your grilled BBQ chicken rice bowl. 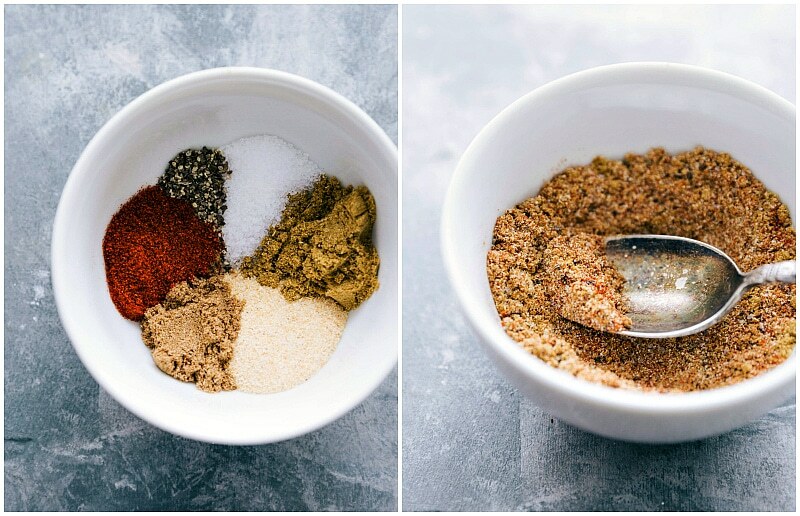 Make it vegetarian: toss sweet potatoes in the chicken seasoning mix and use them in place of chicken (tutorial on roasted sweet potatoes here). Chicken: let the cooked chicken cool, chop it into bite-sized pieces, and place it on one side of your meal prep container. Rice: let the cooked rice cool and place it on the other side of your meal prep container. Add beans and corn on top and seal the container. Prep “cold” ingredients: add all the “cold” ingredients (cheese, lime, & tortilla strips) you don’t want warmed through into a separate bag or container. While you can add avocado to these meal prep containers, I highly recommend buying pre-made guacamole snack packs (usually found in the produce section by refrigerated dressings/sauces) and adding one guacamole pack a day to your lunch. Assemble: when you’re ready to eat, warm through the chicken, rice, beans, and corn mixture. Top with the avocado/guacamole, cheese, tortilla strips and drizzle on a few squeezes of lime juice. Enjoy! 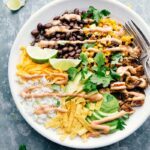 Easy spice-rubbed grilled BBQ chicken in a delicious burrito bowl style meal. 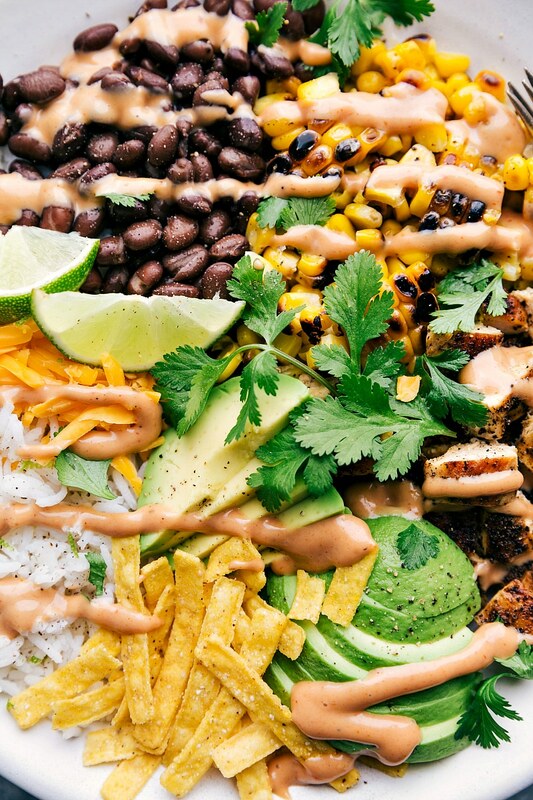 This BBQ chicken can stand on its own OR serve it with cilantro-lime rice, black beans, corn, cheddar cheese, avocado, tortilla strips, and an addictive spicy-sweet BBQ sauce. This is a meal you'll want to make over and over again! RICE: Cook rice in chicken broth, stock, or water. Once cooked, fluff with a fork and add the juice of a lime (to taste; I add all of it) and cilantro to taste. CHICKEN: Remove excess fat from the chicken breasts. Slice the breasts in half horizontally, cover with plastic wrap (avoid splatter), and pound halves to an even thickness using a meat mallet or the bottom of your frying pan (this helps them cook evenly) Add the salt (if you are using table instead of kosher salt, you'll need to reduce amount; also reduce if sensitive to salt), brown sugar, pepper chili powder, paprika garlic powder, onion, powder, and cumin to a small bowl. Stir. Pat chicken dry with a paper towel, drizzle with oil (use a silicone or pastry brush or your hand to evenly spread the oil) and then sprinkle and gently press this seasoning mixture evenly onto all sides of the chicken pieces. ASSEMBLY: Separate the rice and chopped chicken into 4 separate plates or bowls. 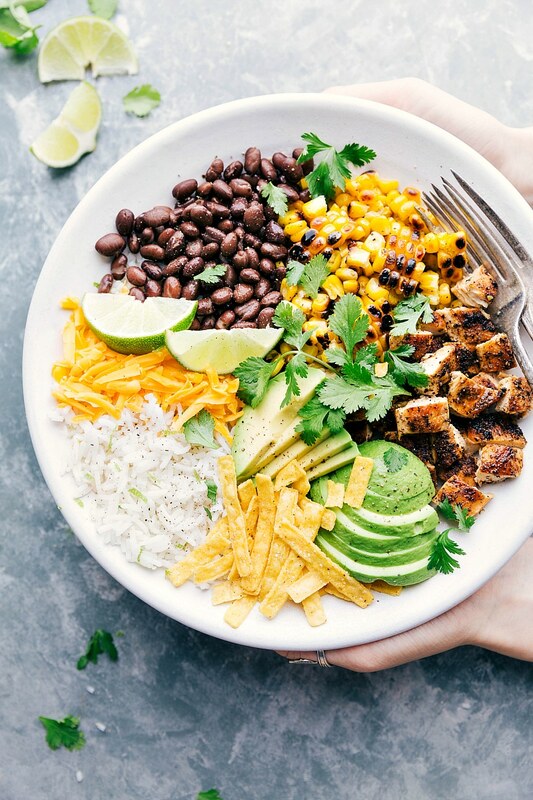 Add your favorite toppings evenly among the bowls (we add drained and rinsed black beans, drained corn, avocado, cheddar cheese, and tortilla strips. 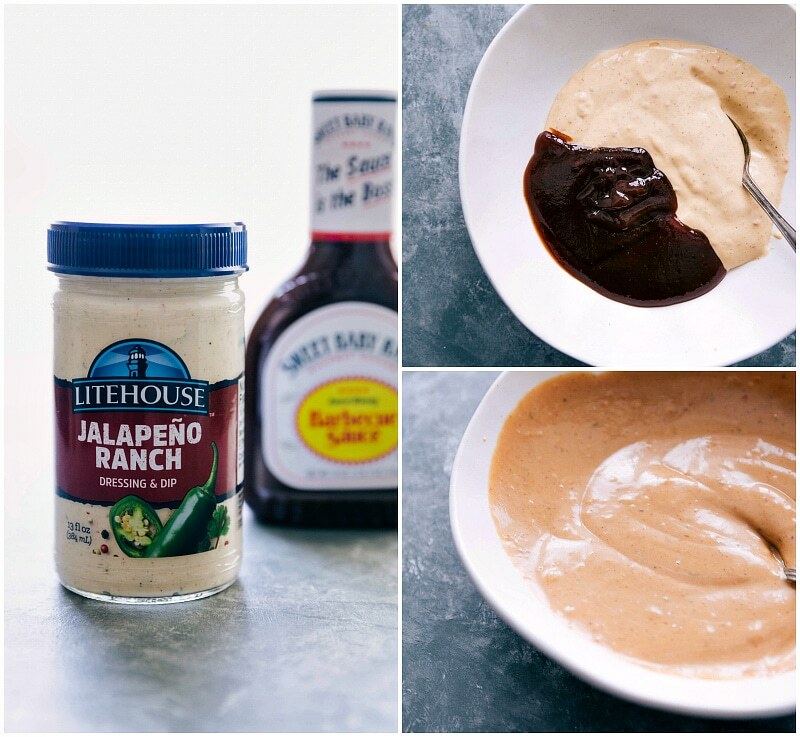 Whisk together the jalapeno ranch dressing and BBQ sauce and spoon/drizzle over bowls (Add as much or as little of this sauce as you want; we love a lot of sauce!) Serve bowls with a few lime wedges and sprigs of cilantro if desired. Note 2: I find the jalapeno ranch dip in the refrigerated area of the produce section of the grocery store. (See post for the product photo of what I used). Spicy ranch also works here, but is quite a bit spicier. Note 3: for alternate cooking methods check "Alternate chicken cooking methods" in the blog post. Note 4: Alternatives to canned corn: sauté (drained or completely thawed out) corn kernels in a preheated large cast-iron skillet 3 to 5 minutes, stirring constantly, until kernels are lightly charred over high heat. Remove to let cool completely before adding. Alternatively, grill cobs of corn, let cool completely, and then slice off the cob. To grill corns on the cob: peel back husks and remove silk. Rub oil on all sides of the corn and lightly salt and pepper. Place on heated grill (400 degrees F) and rotate every 3-4 minutes or until charred. Remove let cool and then slice off the cob. we loved these bowls!!! thank you! You have chicken breasts listed twice with slightly different amounts.